This is just a very small sampling of this type of material that I have in stock. Because they are often one-of-a-kind inexpensive items, it is usually not cost-effective to do all the work required to put such items on the website. However, this type of material is available for viewing on approval. 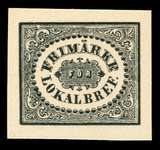 The philatelic term "Cinderella" is loosely applied to just about any type of item that is stamp-like, but is not listed in the traditional "standard" postage stamp catalogs. Wide variety of items; new items added all the time. Be sure to see the next section too! Just about every possible type of "Cinderella" item: Adveristing & political labels, Christmas & charity seals, revenues, poster stamps, local posts, railway stamps, shipping company freight stamps, reprints, fakes & forgeries, etc., etc., etc. Includes a interesting thematic/topical items. No descriptions -- what you see is what you get. Created by early stamp album publishers to decorate album pages. They make fantastic collateral items to dress up modern stamp album pages. There are many sections of Cinderella items in the Scandinvian price lists. The best place to start are the Country Table of Contents pages where you will find specific pages devoted to specific types of Cinderellas. Additionally, Scandinavian Cinderella items newly added to the website are often temporarily only in the New Arrivals - Diverse pages. 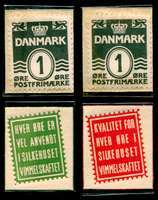 In addition to labels, Christmas seals, charity seals, etc., you will likely also find revenues, railway stamps, shipping company stamps, local post stamps, savings stamps, reprints, essays, etc.